Welcome to my viewing diary for The X-Files. Every day, except Saturday, I will offer a short review of another episode until I finish the first season. Future entries will cover the remaining seasons, breaking to review the feature films where chronologically appropriate, and eventually reach the recent miniseries. I have seen very few X-Files episodes, though I was utterly fascinated with the concept as a child, so for the most part this will be a first-timer's perspective. There will be NO spoilers. Story (aired on November 5, 1993/written by Glen Morgan & James Wong, directed by David Nutter): "Ice" opens like a conventional nineties action film, with the buff bare-chested combatants (Ken Kirzinger, a stunt coordinator for the series, and Sonny Surowiec) facing off in an iconic gun-to-each-other's head pose, against a classic generic-science-station backdrop straight out of Goldeneye (the video game, anyway). Then, a twist: in mutual, silent agreement, they each place the guns to their own temples and pull the triggers. Prior to this suicide pact, one of the men, the last of a geophysicist group stationed way out on the Alaskan frontier to drill deep into a glacier, records an ominous message which the FBI eventually watches in the safe, cozy confines of Washington, D.C. As static envelops the frame, the soon-to-be-dead man mutters, "We are not...who we are." 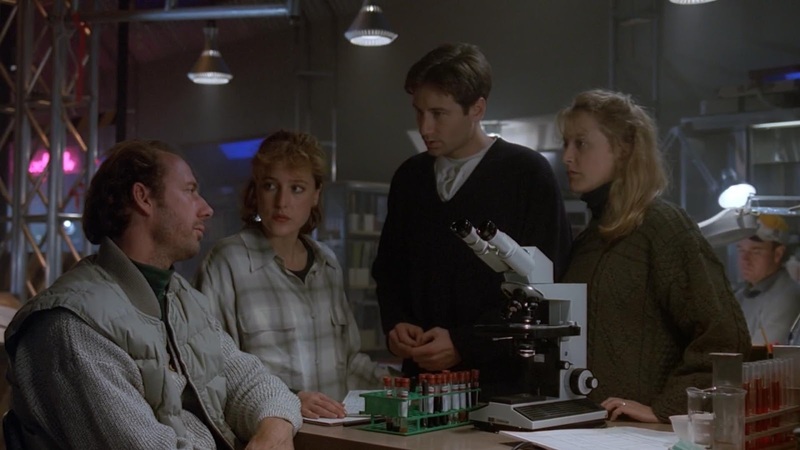 Scully and Mulder join three scientists and burly pilot Bear (Jeff Kober) to form a dirty half-dozen investigating the source of the transmission. The scientists are physician Dr. Hodge (Xander Berkeley, quintessential "suspicious official"/professional prick character actor in the nineties and zeroes), the goofy, geeky he's-gonna-die-isn't-he? geologist Dr. Murphy (Steve Hytner, who played Bania on Seinfeld - "Gold, Jerry, gold! "), and toxicologist Dr. De Silva (Felicity Huffman, whom I dimly recognized but was still surprised to see credited). At the site, they are attacked by a dog and discover a parasitical worm moving under its skin. Studying the strange creatures, which may derive from a wayward asteroid frozen many millennia ago, the team realizes that this parasite ends up controlling the victim's behavior and forcing them into violent, eventually homicidal confrontations. Bear is the first to be taken over and eventually killed when the worm is removed, meaning that the others are stuck there until rescue can arrive. Studying the creature and eyeing each other suspiciously, the team descends into further infighting when Murphy is discovered with his throat slit. A solution is discovered: if a second worm is introduced into the host, the two parasites will kill each other and then be flushed out of the host's body. De Silva and Hodge try to force this treatment on Mulder, convinced that he is the host/killer. (Scully is initially convinced as well, but after an intense heart-to-heart, one of the most dramatic moments between these two partners in the young show, she believes his innocence). At the last moment, everyone realizes that in fact De Silva is the host, and they are able to force the second worm into her ear, saving her, them, and possibly the human race. I did like "Ice"'s twist on this concept, with the enemy being a seemingly innocuous worm rather than a prowling shapeshifter, but was expecting/hoping for more of a twist in the end. What if, after being evacuated, the dog starts acting up again and we realize with a chill that it's only a matter of time before Da Silva becomes homicidal again too? What if the camera reveals an always-shifty Hodge stealing a sample of the worm, for his own personal study, when no one's looking? What if, too late, the team realizes with shock that the two parasites observed under the microscope weren't simply fighting, at odds because they don't need each other to reproduce, but were in fact mating before they die - and leaving behind a tiny larvae inside the victim, even more pernicious than its parents? Perhaps because time is limited and this is supposed to be a standalone, the writers go a much simpler and less ominous route. That said, I suspect we may not have seen the last of Dr. Hodge. Next: "Space" • Previous: "Ghost in the Machine"